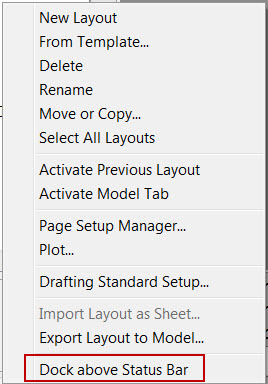 There is a new feature in Civil 3D 2016 wherein the model and layout tabs are placed in-line with the status bar. I believe this was done in order to save some real estate on the screen. What you will notice is that the model and layout tabs move up and down depending on the length of the status bar. Usually this results in the tabs shifting up in model space when the status bar takes up more space, and the tabs shifting down in paper space when the status bar is shorter. If you are like me, this is not your favorite feature in C3D 2016. I prefer the old static setup where the tabs are all located above the command line at all times. That being said, you can set them stationary in 2016 fairly easily. Of course, you sacrifice that row of real estate in doing so, but at least the tabs won’t be jumping all over the place on you, which is what I prefer. Simply switch to any of your layout tabs, right-click on it, and choose Dock Above Status Bar.